Available at China Vasion, this gadget is able to charge virtually any portable device. 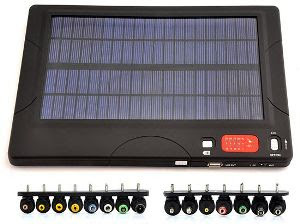 The High Capacity Solar Charger and Battery includes a powerful 20,000mAh battery and comes with 29 unique adapter tips that make it possible for the user to charge various portable gadgets. Due to the fact that the solar array of the charger is quite large, it can store more energy on its battery. The list of the most popular gadgets that the user of this device will be able to charge includes: laptops, cell phones, MP3 players, MP4 players, portable GPS navigators, digital cameras, HD camcorders, portable DVD players, portable and video game players. For an easy carrying the charger comes with a free carrying bag, where you can place not only the solar charger and battery, but also some other gadgets.